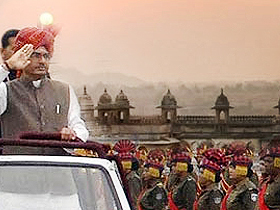 Governor Smt. 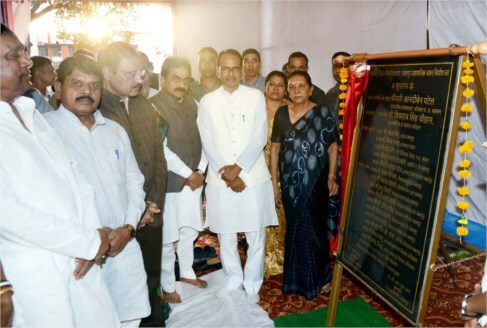 Anandiben Patel and Chief Minister Shivraj Singh Chouhan inaugurated construction work of Administrative Building of Madhya Pradesh Ayurvigyan University to be built at a cost of Rs. 20 crores 38 lakh in Jabalpur on September 10. Governor Smt. Patel said that beginning of the administrative building’s construction work of the Ayurvigyan University in Jabalpur is a moment of happiness. She further stated that the state government is making honest efforts to provide better medical facilities to children, elders and poor. The state is constantly moving forward in the field of medical education and it will certainly prove beneficial to people in the state. The Governor mentioned that insanitation is the root cause of several diseases. We should make efforts to ensure cleanliness in our surrounding to avoid diseases. She said that keeping in view children’s health, arrangements made in the primary schools and aaganbadi kendras for dental and eyes checkup along with blood test of children is important. The Governor also cautioned about the danger of the decline in haemoglobin level in girls. On this occasion, Chief Minister Chouhan said that just like other countries, the language of their country is the medium for all types of studies, in the same way, the initiative should be taken to implement the Hindi language in medical streams. He said that the exchange of ideas in one’s own language will certainly be possible in a better way. The Chief Minister congratulated Dr RS Sharma, the Vice Chancellor of the Medical University, for conducting an examination in the Hindi language. In his address, CM Chouhan also mentioned about the Indian system of diagnosing and treating diseases by checking the pulse. He said that there is provision to provide treatment in private hospitals as per need under the Ayushman Bharat Yojana. Referring to the payment of fees of students taking admission in medical, engineering and other vocational courses by the government under Mukhya Mantri Medhavi Chhatra Yojana, he said that in 2017 the government paid the fees of 800 students who took admission in medical colleges. CM Chouhan emphasized to take steps for promoting Ayurveda and other medical treatment methods along with allopathy at the university. 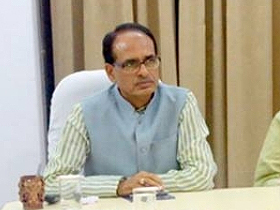 CM Chouhan hoped that the Medical University will give a new direction to medical colleges of the state and will also help check the shortage of doctors. Referring to the Super Specialty Hospital, the Chief Minister said that Rs 44 crore 8 lakhs have been approved with a view to enhancing expertise in the field chest, tuberculosis and neurology. MP and State Bharatiya Janata Party President Shri Rakesh Singh said that medical science is the biggest medium of service of the world and a doctor is considered next to God. He said that Jabalpur is one among those cities in the country where five universities are functioning. The credit of three out of these universities goes to Chief Minister Chouhan. Governor Smt. Patel and the Chief Minister released the Journal of Dentistry prepared by the Dental Science Faculty of the Medical University.